Prior to assessing information literacy instruction, intentional design must be in place. To design effective instructional sessions, Zald & Gilchrist (2008) recommend asking 5 questions. Outcome -- What do you want the student to be able to do? Information Literacy Curriculum -- What does the student need to know in order to do this well? Pedagogy -- What type of instruction will best enable the learning? Assessment -- How will the student demonstrate the learning? Criteria for Evaluation -- How will I know the student has done this well? Classroom assessment is learner-centered and formative. It assesses what students know and what they can do. Feedback is almost immediate, as it is usually done in the classroom. It does not assess student satisfaction with instruction or teaching methods. Assessment can be done one of two ways: formative or summative. 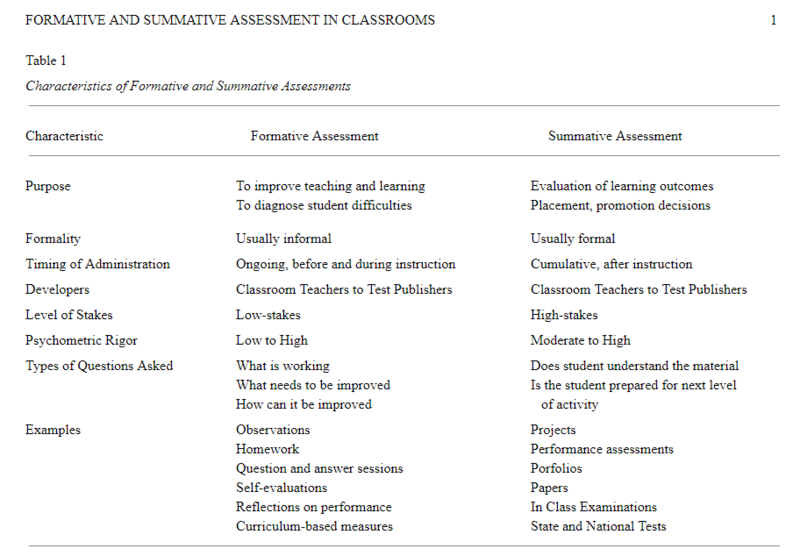 Formative assessment involves gathering data for improving student learning, whereas summative assessment uses data to assess how much a student knows or has retained at the completion of a learning sequence (American Educational Research Association, American Psychological Association, & the National Council on Measurement in Education [AERA, APA & NCME], 2014). Formative assessments occur in two primary forms: spontaneous and planned (Cook, 2009). Spontaneous formative assessments are impromptu, such as (a) when a teacher reads misunderstanding in the body language of students during a class session and queries the student about her understanding, (b) when a teacher calls on a student to provide an example of a concept just covered, or (c) when question-and-answer sessions are conducted during a lesson. Planned formative assessments include activities such as quizzes and homework exercises that are assigned to assess student progress. Summative assessments are “cumulative assessments . . . that intend to capture what a student has learned, or the quality of the learning, and judge performance against some standards” (National Research Council, p. 25). Unlike formative assessments, which are generally used for providing feedback to students and teachers, summative assessments are generally high-stakes assessments and used to get a final assessment of how much learning has taken place—that is, how much does a student know (Gardner, 2010). Use CATs to assess learning outcomes. Complete a CAT Planning Worksheet to determine which CAT is appropriate for a library session. Test CATs on yourself or a colleague before administering to students. Analyze the information collected in a CAT as soon as possible to provide feedback to faculty, design a follow-up session, or create a tool, such as online, to address common issues apparent in a CAT. "Close the Loop." CATs are useful in building metacognition but only if students know what the results of a CAT reveal. Use CATs to gauge students' abilities and knowledge prior to or at the beginning of a library session. Partner with a course instructor to administer prior to a library session. Use CATs to aid with student retention. "Close the Loop." Share results with instructor/students in a follow-up session, email, video, or LibGuide. Administer prior to or at the beginning of a library session. Ask students to share ideas and beliefs about upcoming material. The preconception check can take several forms (true/false, multiple-choice, short-answer). Instructor Question - Where would you expect to find a thorough biography of a historical figure? Address issues of common ground/misconceptions as evident in the Preconception Check. Use common ground/misconceptions to garner class discussions and to explore gaps in their knowledge and reinforce concepts they already know. Emphasize the issues illuminated by your students' comments during the next class. Email or converse with faculty member if you are unable to attend next class. Administer the minute paper midway through a library session. While students are working on a task, read the minute papers and respond to questions before class ends. Ask students at the end of a library session to reply to this question: "What was the muddiest point in _____________?". Use sparingly, as asking for negative feedback too many times can be discouraging to students and librarians. N/A Follow up with the class and attempt to clarify muddy points, either via e-mail or by creating and sharing a LibGuide. Present students with a table of two-three categories. Give students a scrambled list of items and ask then to sort the items in the correct categories. Allow students to create new categories or create their own categories based on the scrambled list provided. Adapt to have students categorize physical objects, such as physical publications. Analyze the grids for patterns in incorrect responses. Provide feedback to the large group through email, LibGuide, online video, or a follow-up library session. Assess Analysis and Critical Thinking Ask students to analyze the what, how, and why of a message. Apply to a critical reading or a nontextual message, such as a database. Are students able to paraphrase content (WHAT)? Can they identify form (HOW)? Can they see function within the larger context (WHY)? Pro and Con Grids assess the evaluation skills of students. Ask students to list the pros and cons of the problem or issue. Expand the grid to include a caveat. Change the grid to costs/benefits or advantages/disadvantages. Ask students to complete the grid from multiple perspectives. If possible, present a chart or other visual with their resutls. Students write a one-sentence response to a question about a new concept. Their answer should summarize who does what to whom, where, when, why, and how. Tell students at the beginning of a library session what they should learn and how they will be asked to demonstrate it. Instructor Question - How and why do scholarly journal articles get published? Student One-Sentence Summary - (who) Researchers (does what) publish the results of their research (where) in scholarly journals within their field, (to whom, when) after peers have reviewed their methods and results, (why) in order to disseminate information and further scholarly conversation. Revisit the topic with the class through email, LibGuide, tutorial, follow-up assignment, or another session. Ask students to paraphrase a key idea for a specific audience. This CATS is especially useful when working with pre-professional students, "who will likely have to explain complicated or specialized concepts to a particular audience throughout their careers" (Bowles-Terry and Kvenild, 60). Provide individual feedback; therefore, this CAT is most appropriate for a librarian-taught or embedded course. Students list what they have learned, questions they still have, and how they will apply the new information. The mix of 3-2-1 can be varied. The questions can be content-specific. The 3-2-1 can be completed individually or within a group. Design a follow-up via email, another class, video, or LibGuide. Share with students the "most interesting or intriguing" responses about how students will use the information they have learned. Adapted from University Teaching and Learning Center. "Classroom Assessment Techniques." The George Washington University. https://library.gwu.edu/utlc/teaching/classroom-assessment-techniques-cats. Modified examples from Bowles-Terry, Melissa and Cassandra Kvenild. Classroom Assessment Techniques for Librarians. Chicago: Association of College and Research Libraries, 2015. Miller, Sara. "Classroom Assessment Techniques: CAT Basics and Tools for Librarians." Michigan State University Libraries. 2013. http://libguides.lib.msu.edu/c.php?g=96988&p=627320. A set of scoring guidelines for evaluating students’ work. Rubrics answer the following questions: By what criteria should performance be judged? Where should we look and what should we look for to judge performance success? What does the range in the quality of performance look like? How do we determine validity, reliability, and fairly what score should be given and what that score means? How should the different levels of quality be described and distinguished from one another? In developing a rubric, it is important to select the specific work to assess. 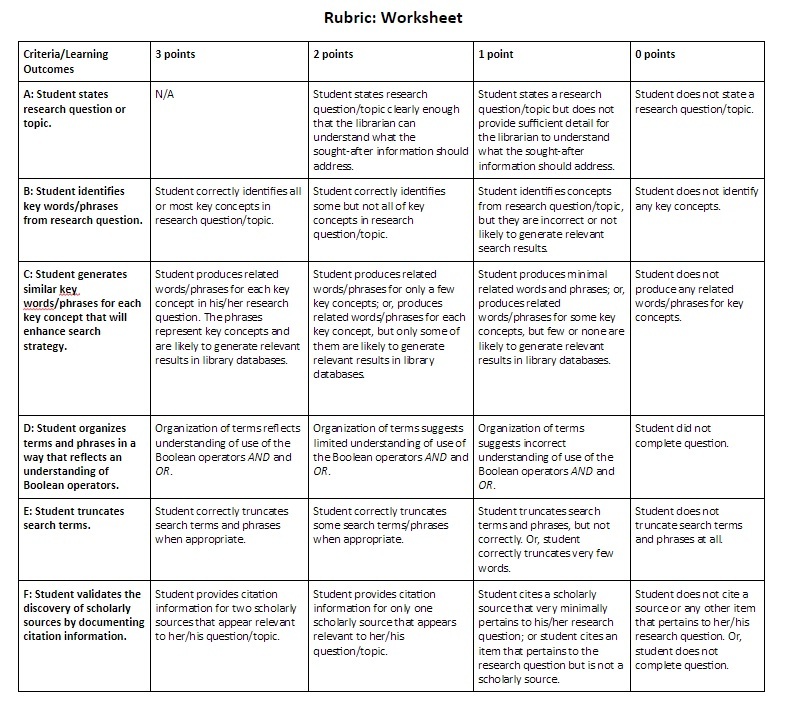 The first example (Rubric: Worksheet) provides a scoring guideline for a research worksheet completed during the library instruction session. 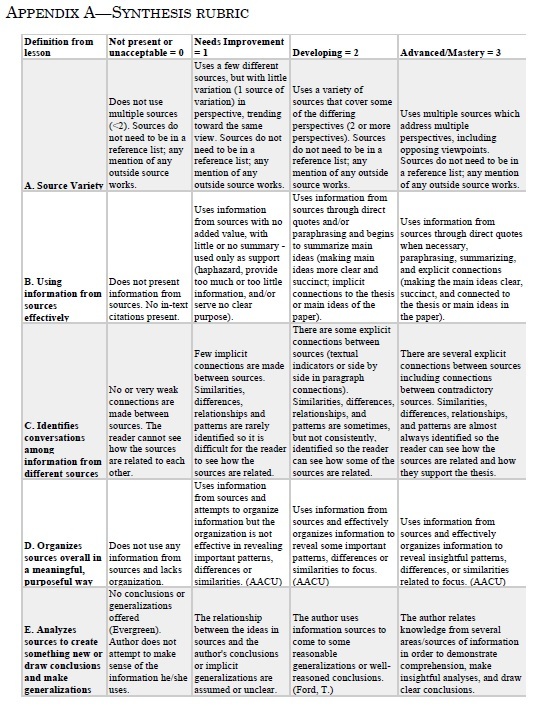 The second example (Synthesis Rubric) is a rubric of a research paper completed after the instruction session. See PALNI's Framework for Information Literacy guide for learning outcome ideas that align with ACRL's Framework for Information Literacy in Higher Education. The resources linked below provide a variety of pedagogical techniques to apply in the classroom prior to assessment. The Librarian Evaluation tab also provides information and resources for improving teaching.